This week was a regular work week and an office visit to Dr. Bosshardt for one more expansion. I want no regrets and feel this is a good choice. I am not that big, just slightly bigger than I was originally. After today, I have a two-week waiting process before we start moving toward the 20% and then we wait two (2) months before surgery. Surgery for the reconstruction process and the removal of the port that I have had for so long. My LAST chemo. YEAH! A little nervous as there is a feeling of comfort knowing that you are getting medication to help fight the cancer, but on the other hand those same medications are brutally hard on your body. With that, I am ready for the last one and know that the cancer has NOT spread and by staying on my same nutritional path and exercise I can keep the cancer away forever and be a survivor forever with no re-occurrence. I worked a half day Monday, a full day on Tuesday, had my last shot on Wednesday (for my immune system) – – cold and hurt like heck! !, worked half a day Thursday (Christmas eve) and we were off Friday. Yeah! Nice week – finally. I was ill Thursday and Friday and started to get better Saturday. Rob & I went over to see the family for Christmas Saturday since I was unable to on Christmas day. Happy Birthday to Heather Marie who is 19 this year on Christmas. Unbelievable. I have to say that although I do not regret my decision regarding the “one more expansion”, they are getting so uncomfortable that I cannot wait for surgery so as to actually have the implants in that are more comfortable and so I can sleep better. These things are feeling hard and now I know what exactly the doctors meant when they said that there would be no feeling in your breast, no normal feeling, as that is exactly what I am experiencing and am uncertain on how I feel about that. 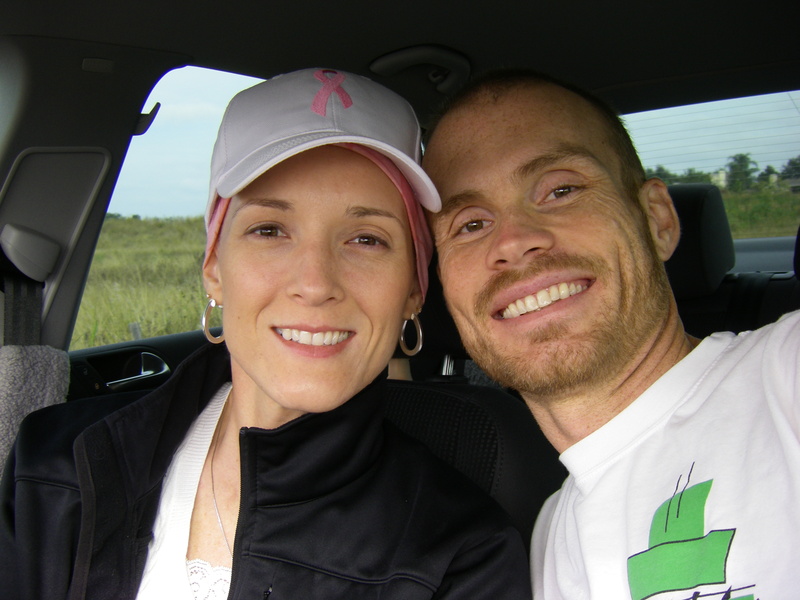 Having a double mastectomy takes all feeling away. Not that I really had a choice in the matter. I have a short week this week what with New Years and all. I am off Thursday (personal day) and Friday is New Years day, 2010. Rob and I are off to St. Augustine, FL for the weekend of New Years 2010 and look forward to a little vacation. It has been a long last six (6) months and I need a little away time. St. Augustine is always a great place to go for a getaway. New Years Eve and Anniversary on 1-1: Rob & I traveled to St. Augustine, FL where we go every year and stay at the Carriage Way Bed & Breakfast. John, Larry & Bill are so great and our stay is always the best. We got there on the 31st and spent New Years Eve watching the ball drop with John. The rest of the weekend was nice as Rob & I ate at some very nice restaurants (The Reef, The Bubble Room, The Maya Restaurant, and The Florida Cracker) and finding out what I could eat became a little easier. Our anniversary, three (3) years. 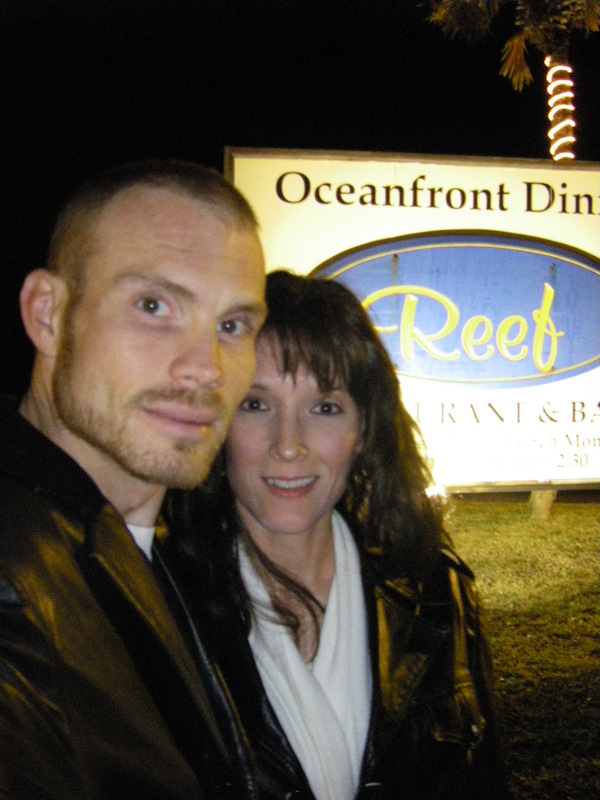 Rob & I spent the day touring around St. Augustine and had dinner at “The Reef”. A nice restaurant on the water there with a nice view. A lot has happened in our three years married – and he’s still hanging around. Most would have already left me and probably couldn’t handle it. I say this from experience losing friends and family while I am ill.
Today I am set to get my first set of scans after the chemo treatment. My first scan, the PET scan is at 7:00 a.m. and the CT is scheduled for 9:00 a.m. Rob is going with me to get them done and we wait for a week to get the results on the 18th at 3:00 p.m. with Dr. Kunta. All went well and after Rob & I went to breakfast at Perkins. Now, the fun is over and back to work. Today I was surprised by an early 40th birthday party at the restaurant “Dutch” by Rob. He had asked me if I wanted to go with him to Home Depot to refill the grill tank and then to lunch. So sure, I was up to it. We decided on lunch at Dutch, me not knowing that there was a party in the back. When I walked in, Dutch (the owner) took us to the back where there was better seating – through the kitchen I might add – and when I walked through everyone yelled “surprise.” I started to cry because it was the nicest thing anyone had ever done for me. There were many people who actually wanted to be there to show me that they loved me and are happy that I am here, 40, and we all know I will be Cancer free. For a small list of who was there: Bob and Annaliese, mom and dad, Randy & Cheryl, Heather and Brittany, Trina, David and Brittany, Theresa, Uncle Frank and Aunt Mary, Uncle Jack and Aunt Jill, Heath, Karlos, Matt, Sandy and Matt’s mom, Lynn (from work), Cindy & Kathy (from work), Barry & Kristi, Yvette and her two children, and Lori and Megan. What a great surprise. After my last 20% expansion this morning with Dr. Bosshardt, I had a 3:00 appt with Dr. Kunta for my results of my scans. Dr. Kunta advised that my scans were perfect, clean and clear and told me he would continue to treat me to keep the Cancer away. I got a name and number of a Dermatologist, Heather Brock, so I could have them check my skin so I can stay Cancer free. 40th Birthday ~ Hmm… I MADE IT!! Rob was sick the past two days or so, but made me a nice dinner here at home. Now that I am Cancer free, I am going to need to stay on top of it by keeping up with my nutritional habits as well as my continued exercising. No going back to the ways of before. Something like this changes you and makes you realize what is really important in life and what you should do in order to stay here longer to see your nieces and nephews grow up and graduate and grow old with your brothers whom you would miss so very much. I always knew prior to this what things were important and not so much as well as worth fighting for, but Cancer puts it greater perspective and you literally find yourself not in the mood for any negativity from anyone. So – – I wait for my hair to start growing back and sit for two (2) months while I await my appt on March 4th with Dr. Bosshardt to schedule my surgery for my implants. Thank goodness for insurance! If my insurance did not pay for reconstructive surgery, I would have never gotten it. I was lucky enough to have that choice. They do not mean that much to me nor would I miss them. Besides, Rob already said he did not marry me for my breasts or looks, but for my heart and what’s inside. So with that, I could not ask for anything more. The weeks have passed with no new events until the first week here in February. My hair started to show some growth. Although, my eyebrows and eye lashes continue to fall out. Rob says that my new lashes and brows are pushing out the old ones. Hmm…, maybe so. I any case, just this past week, the week of the 15th, my expander on the left side has been causing me pain. It has somehow come to a point inside on the left side under or close to my arm and managed to make a bruise and pinch a nerve at the same time. The pain is sharp although not all the time. It is only once maybe twice a day with little jolts here and there throughout. Goodness, just when I think I can reach for that glass or wash my head in the shower the jolts or pain come. Wigs, wigs and more wigs ~ Since I have no hair, I have been experimenting with wigs here and there. Nothing too extreme, yet. They seem to fit well and don’t look too bad. I’ve always had really curly hair and could not find a good curly wig, so I went for straight. I don’t wear them all the time. Most times I prefer a little bandanna. In the evenings, my head gets so cold that I have a little red and white stripped hat I wear to bed to keep my hear warm. Thank goodness for this. I went to see Dr. Bosshardt today where he took some fluid out of my expanders thinking that might help, but it did not. I told him it would not matter because the expander came to a point inside and the size would not matter. Oh well. I only have to live with it until March 19, that is when my surgery is scheduled. Yeah!! I hope everything looks better than I expect and goes well. Later this night, Rob & I were given an invite to go see the true story, movie, called “Letters to God”. It was a very good story about a little boy with brain cancer who writes letters to god and prays about many different things and people. It was filmed here in Clermont/Winter Garden. It was very sad, but a good story for all to learn from. I seem to be feeling just fine other than the pain I keep having in my left expander. It has come to a point underneath my skin and is either pinching my skin or a nerve underneath. In any case, it is quite a jolt of pain when it happens and I never know when it will. I cannot wait for surgery. A beautiful day for a Winter park 10k run. My first 10k, Yeah ­ ­ I finished in 1 hour and 28 minutes. Not so bad. Matt, Sandy and I walked/jogged it and had a good time. Rob’s knee was still hurting him from his 300 mile ride a few weeks back so he did not do it. We found out today that my cousin, Bobby, has Colon Cancer. The family is not telling him *just yet as they need him to recover from his operation on his intestine/appendix he just had yesterday, March 17. I pray God gives him the strength and the immune system to fight this. He’s been through so much and is such a fighter. He is my light and my strength! !